I have, over the past several years, seen a lot of cute patterns for dishcloths. I have even printed out quite a few, and acquired a decent stash of worsted weight cotton. I have not, however, actually knit a dishcloth yet, despite all the patterns and the yarn. Or rather, I hadn’t knit a dishcloth until today. It’s at this point that I admit my true reasons for signing up for Dishrag Tag (proposed and organized by Emily) – to finally spur me on to making at least of the darn things (using some of the patterns for the sampler squares of an afghan doesn’t count, you see). Basically, this is a relay race, where each member of the team knits a dishcloth, then sends that cloth, along with two balls of cotton worsted and a small treat, on to the next person in line, and so on until the entire team has finished, at which point the box is sent back to Emily. First team to get their box back to its starting point wins. This was perfect. First, it would get me to finally get around to making a dishcloth; second, it appeals to my competitive nature (which is always guarenteed to get me knitting insanely fast); third, it sounded like too much fun to pass up. My team box arrived today. Since I’m 8th in line (for a team of ten), the box looks a bit worse for the wear at this point. Here’s what was inside (cat included because it was easier than trying to convince him to move). I immediately snagged the ball of white yarn, a set of needles, and the pattern I wanted to do, and got started. 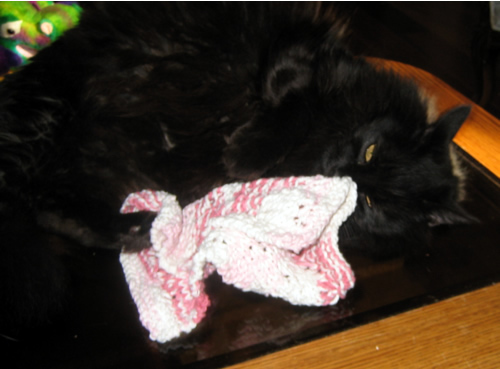 In the time it took me to set up, the dishcloth included in the box had been grabbed, and Azzie proceeded to roll around on the table rubbing his face all over it and generally having a wonderful time. If I didn’t know any better, I’d think my teammate tossed some catnip into the box before she sent it out (grin). Monday nights are rehearsal night for the women’s choral ensemble I’m in, so I had to stop about halfway through knitting my dishcloth. I made sure to move my project-in-progress out of the reach of curious cats, but it did not occur to me that the untouched skein of cotton might be in danger, until I got back home from rehearsal, and by then it was too late. I have a few cats in mind as suspects but cats are extremely good at looking innocent, and no one is talking. Anyway. Here is my finished dishcloth. I used a bit less than one ball of Sugar & Cream cotton, and this pattern. Tomorrow morning I’ll put two balls of worsted weight cotton, the completed dishcloth, and some sort of small, lightweight treat, into the same box. I’ll see what repairs I can manage for the poor battered little box with a few extra layers of packing tape, and then get it into the mail on my way to work. oh my! that box is really taking a beating! the cloth looks great though, nice work 🙂 love the kitty and cloth photo. when’s the funeral for the unused yarn ball? 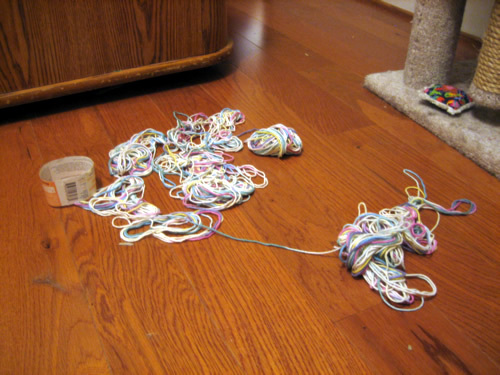 the poor yarn ..sniff.. I hope the box holds up for a few more mailings! So who gets to keep the dishcloth, you or Azzie? Oh, my! Like Laura said, this isn’t supposed to be a Team Hard Luck competition too! And you knit an especially lovely wash cloth. I’m excited that the box is on the way to #9! I was an earlier team member of POST knITS. 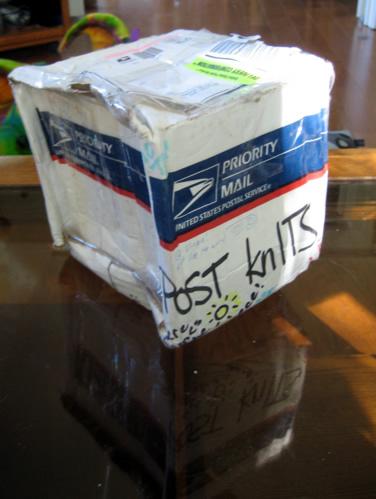 When I took the box to the post office to be mailed, the lady behind the counter was wondering if I was in line to register a complaint because the box was already looking well-traveled and worn…. The washcloth is lovely! I can’t believe it’s your first. I am also very excited about the yarn, I’ve been wanting to try a bamboo yarn. Oh, so sad about the yarn! I hope it doesn’t take too long to untangle. You certainly have playful cats. 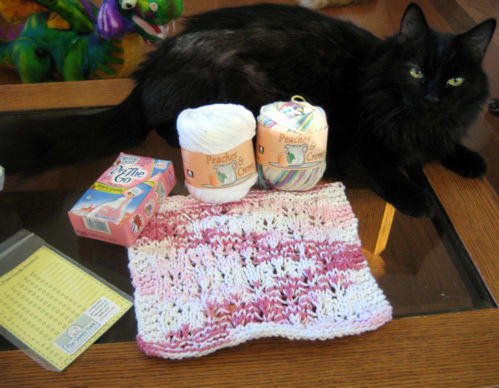 My yarn weasel kitten Spartacus has mellowed with age. I still have to hide the animal fibers from him, but he’s pretty indifferent to cotton. 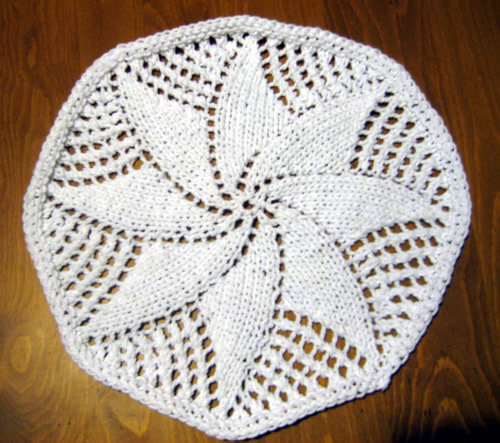 I’m reading some of your older blog entries and love the dishcloth which I think you call Double Flower (somewhere around Aug. 2007) but when I try to get to the pattern I find myself at a French website and can’t find my way around it. Any other way to get that pattern? I love knitting (or crocheting, which I do little of) dish cloths which I end up using as face cloths most of the time. This one is particularly beautiful.